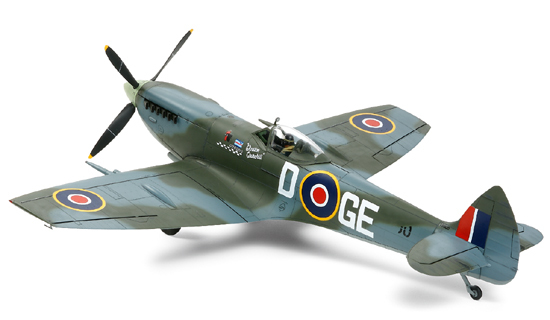 TAMIYA 60321 SUPERMARINE SPITFIRE Mk.XVIe (1/32) scale model kit! 1/32 scale plastic assembly kit of the Spitfire Mk.XVIe. Overall Length: 302mm, Overall Width: 311mm. Distinctive features of the Mk.XVIe, including Packard Merlin 266 engine, E Type wing, teardrop canopy, and modified landing gear legs, are accurately reproduced. Canopy may be opened even after assembly. Features movable ailerons, rudder, and elevators. Flaps can be depicted in either up or down position. 30 gallon drop tank, two 250lb bombs, and 3 types of markings included. Comes with 3 kinds of markings to depict the aircraft from Royal Air Force squadrons as well as the (Pilots) Refresher Flying Unit. 2 pilot figures, 1 seated and 1 standing, are included.